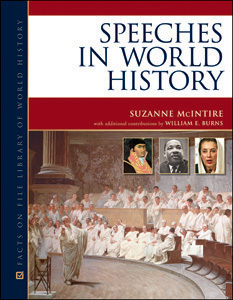 Speeches in World History is an impressive compilation of 200 of the world’s greatest speeches from all major civilizations and throughout history—arranged in chronological order. Each section of this comprehensive collection, roughly corresponding to the eras used in the national world history standards, begins with an introduction that outlines key events that occurred during this time period. The documents come with an introduction that places each speech in historical context—explaining why it was significant and what happened as a result—and provides key information on the orator. Famous lines from the speeches, sidebars on rhetorical devices, and black-and-white photographs and illustrations are placed throughout the book. An appendix gathers helpful tools for analyzing speeches, working with primary source documents, and preparing for declamation and debate assignments. Lists of entries are organized by title, by orator, and by location, making the information easily accessible for students. A comprehensive bibliography and a thorough index round out the collection. Gathering speeches from more than 50 countries, Speeches in World History will be an invaluable tool for middle and high school teachers, students of world history and English, as well as those participating in public debate contests. Wangari Muta Maathai: "Our Future Is in Our Environment" (2007, United States). "This outstanding resource will provide students with a well-rounded list of resources as well as tools for their own persuasive speech making...Highly Recommended." "...an ideal companion to any high school or college-level speech class..."